Due to the extensive amount of papers, photographs, scrapbooks, and other items that were removed from Balmanno Cottage, I spent a long time processing the Blanchard Bartlett Walker Collection. Even when I thought I finished, more boxes would be found in the Archives or items that had been forgotten in the freezer (to kill possible mold) were remembered. What we have now is the incredible story of Blanchard Bartlett Walker told in her own words in diaries and scrapbooks detailing her lifetime of travel, charity, and more. As I processed the collection, I was fascinated with where she traveled and who she met along the way. Daughter of HWS President Rev. Murray Bartlett and Blanchard Howard, an heiress to one of the early Eastman Kodak fortunes, Blanchard Bartlett Walker was a well seasoned traveler and “grand dame” of Geneva society (Finger Lakes Times, February 19, 1997). She secured a role in a Broadway production for a year before volunteering with the Red Cross during World War II operating “rest and relaxation” hotels for Allied troops. Blanchard was among many Genevans who joined the war efforts during World War II, moving across Great Britain and Europe due to assignments with the Red Cross. Our Archives hosts a great number of photographs from this period of Blanchard’s life, photos from all over Great Britain and the Continent, of soldiers, their families, and those she worked with. 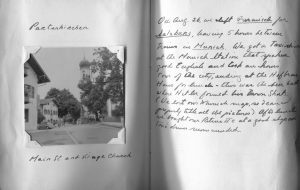 Correspondence with her parents from her time with the Red Cross also includes her adventures as she traveled from the States to England, through Europe and into Germany. Blanchard’s travels were of great interest to her fellow Genevans, many of her activities were reported in the Geneva Daily Times, including the capture of a burglar and taking tea at Buckingham Palace with the Queen, King, and other guests. 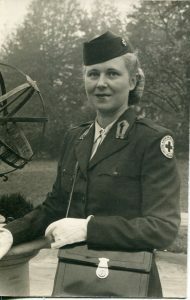 With the volume of her work as a Club Director dwindling in Great Britain, Blanchard was highly recommended to a Red Cross position on the Continent; she would become the director of facilities at the Red Cross center in Wiesbaden, Germany. She kept a diary for much of her younger life which included her time in Italy, France, England, Germany, Manila, and Asia in the 1930s. 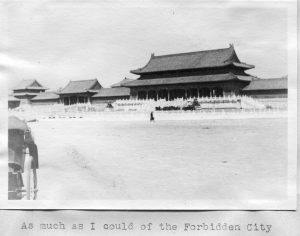 She wrote “A Flight to Peiping” which details her airplane flights in 1937 from Shanghai to Tsingtao to Tientsin to Peiping and back along the same route to Shanghai, with many weather delays, to meet her cruise ship. After her marriage to Dr. William Walker, the two continued to travel across the world; scrapbooks detail their itinerary from as early as 1954 through Switzerland, Germany, France, Britain, Ireland, Japan, the West Indies, and a South American cruise. I wish I could include so much more in this post as it’s fascinating to look through the multitude of scrapbooks that Blanchard created, but there’s only so much space! The Blanchard Bartlett Walker Collection is extensive and holds an incredible amount of detail about Blanchard’s life and about Geneva. Blanchard Bartlett Walker left her home to the Society in her will. For more information about Balmanno Cottage and its contents, read a previous blog article.